Wars have brought untold horrors upon Europe over the centuries, especially the two world wars of the last one. Until now, though, the continent has been spared the ultimate cataclysm of a missile war. Though twenty years after the end of the Cold War recent news articles contain reports that would have been shocking even during the depths of the East-West conflict in Europe that followed World War II. This development is in keeping with U.S Pentagon chief Robert Gates’ presentation of September 17 in which, confirming President Obama’s announcement to replace and supplement his predecessor’s project of placing ten ground-based interceptor missiles in Poland and a complementary radar installation in the Czech Republic, he laid out a three-step strategy to enhance (his word) U.S. missile shield plans in Europe. In a Defense Department briefing with Vice Chairman of the Joint Chiefs of Staff General James Cartwright, Gates explained the logic behind the shift. “Over the last few years, we have made great strides with missile defense, particularly in our ability to counter short-and-medium-range missiles. We now have proven capabilities to intercept these ballistic missiles with land-and-sea-based interceptors supported by much-improved sensors. Land-based facilities are easy to monitor and, if the suspicion arose that they would be part of an imminent first strike attack, neutralize. Sea-based, air-based and spaced-based surveillance and missile deployments would be harder – if not impossible – to track and to take out. “Consultations have begun with allies, starting with Poland and the Czech Republic, about hosting a land-based version of the SM-3 and other components of the system,” Gates revealed. 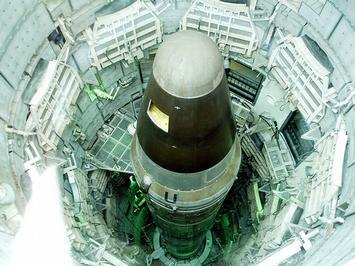 In language that progressively reflected what sounds like plans to withstand a first – or second strike – in Europe’s first missile war, Gates added, “Over time, this architecture is designed to continually incorporate new and more effective technologies, as well as more interceptors, expanding the range of coverage, improving our ability to knock down multiple targets and increasing the survivability of the overall system. The threat repeatedly invoked by the Pentagon chief was, of course, Iran. The inverted logic of the earlier George W. Bush administration program, of which Gates himself was a major architect, ran something like this: Missiles in Poland and an X-band long-range radar installation in the Czech Republic would protect the continental United States from Iranian intercontinental ballistic missiles, which the nation neither possesses nor, as both Gates and Obama themselves conceded on September 17, was likely to in the foreseeable future. But once the U.S. went ahead with the deployments Iran could target both sites with medium-range missiles, the argument continued. So America pledged to station 96 Patriot Advanced Capability-3 (PAC-3) missiles in batteries manned by U.S. soldiers who would be based in Poland for the first time. Thus Poland and the Czech Republic were transformed from sites for missile shield deployments to allegedly protect the U.S. to potential targets that needed to be protected by…the U.S. The Patriot missiles in Poland, which are still slated to be sent and activated there, can no longer be presented as protecting American ground-based interceptor missiles in that nation, as that plan was officially scrapped twelve days ago. So why are they going to be deployed in spite of that? The Patriot deployment was never intended to defend Poland against Iranian attacks, but to counter Russian plans to station mobile short-range missiles in its non-contiguous territory of Kaliningrad, which borders Poland, in response to what Russia necessarily viewed as a threat to its strategic missile forces. Bluntly put, U.S. ground-based missiles in Poland could be part of a system to destroy whatever long-range missiles Russia had left after a U.S. and NATO first strike. Six days afterward Poland’s Foreign Minister Radoslaw Sikorski confirmed that 96 Patriot missiles will be deployed in his nation as scheduled and, moreover, will be armed. As their deployment can no longer exploit the pretext of defending U.S. long-range missile sites from imaginary Iranian “preemptive” attacks, its purpose is demonstrated to be the what missile shield opponents have always asserted it was: To “protect” Poland from Russia. What mobile missile launchers ready for practically overnight deployment to Russia’s neighbor might look like was indicated at last month’s annual Space and Missile Defense Conference held by the Pentagon’s Missile Defense Agency in Huntsville, Alabama where the prototype of a nearly 50,000-pound “two-stage interceptor designed to be globally deployable within 24 hours”  to be stationed as needed at NATO bases throughout Europe was presented by the arms manufacturer eager to produce it, Chicago-based Boeing Company. In his September 17th briefing at the Pentagon, Defense Secretary Gates also announced plans to “deploy new sensors and interceptors, in northern and southern Europe.” He tactfully did not specify where in the north and south of the continent the “capabilities…to detect, track and shoot down enemy missiles” would be placed, but their likely destinations are not hard to determine. The Gazeta Wyborcza last month broke the news that the Pentagon intended to shift major missile shield emphasis to the Balkans, Israel and Turkey. Subsequent reports have focused on the South Caucasus nations of Georgia and Azerbaijan as locations for the extension of missile interception networks closer to Iran and to Russia’s southern border. The Navy Times report cited at the beginning of this piece discussed the transfer of missile shield hardware and priority to the Balkans, the Black Sea region and the Middle East and mentioned as an example the USS Stout, an Arleigh Burke class guided missile destroyer. Last summer the ship had been deployed for naval maneuvers in the Eastern Mediterranean with Israel and Turkey [Operation Reliant Mermaid] and then moved into the Black Sea in its first deployment as part of the Pentagon’s Aegis sea-based interceptor missile system. The USS Stout visited NATO members Bulgaria and Romania and NATO candidate nation Georgia while on the Black Sea mission. While visiting the third country it participated in a joint military exercise with its host’s navy directly south of Abkhazia, which could be the site of a fresh Caucasus war at any moment. So the expansion of the American and NATO missile interception system along a new trajectory that starts in the Balkans and progresses along Russia’s southern border and eastward towards China’s is nothing new. The immediate reference was to Iran, again, but with implications for Russia as missile killer ship deployments in the Baltic and Black Seas would not be limited to or even primarily directed at Iran. NATO held its first-ever top-level meeting – attended by its secretary general, its two top military commanders and the chairman of its Military Committee – on the Arctic seventeen days after the U.S. National Security Directive was released and also broadcast in no equivocal terms interest in expanding its presence into what it called the High North. An insightful and penetrating commentary appeared in The Nation of Pakistan on September 26 which linked U.S. President Obama’s speech to the United Nations General Assembly on September 23 with his statements on missile defense six days earlier. And if White House pledges to reduce or even eliminate nuclear weapons sound something less than sincere – Ronald Reagan’s 1983 Star Wars speech included a proclaimed commitment “to lower the level of all arms, and particularly nuclear arms” – than so do American pronouncements that the nation’s global missile interception system will eliminate or even diminish the threat of dangerous and perhaps catastrophic confrontations. “So there will be no BMD [Ballistic Missile Defense] placements in Poland and the Czech Republic but there will be BMD systems placed on highly mobile sea platforms to counter a largely imagined threat to Europe and the US from Iran. “Of course, these ships can be moved easily from the Mediterranean to the Gulf or Indian Ocean so Pakistan would also come into this BMD target loop – again with India being helped in the development and acquisition of BMD as part of its strategic military alliance with the US. “Now BMD has focused attention on nuclear war fighting, thereby increasing the danger of nuclear weapons being used in war. The preceding paragraphs are as terse yet comprehensive a summation as can be found of the threat the U.S.’s new flexible, mobile and technologically advanced international missile shield strategy presents for raising rather than lowering world tensions, for dropping the threshold of a U.S. and allied missile war being launched because of the perceived invulnerability of the aggressor and, the ultimate worst-case scenario, for nuclear war whether intended or not. A nuclear war which would transform Europe and much of the rest of the world into a gigantic necropolis.